Energy distribution modernization requires a coordinated, strategic, research and development effort, and an implementation that involves collaboration between public and private sectors. Economic growth and prosperity, national security and the health and safety of a nation’s citizens depend on the reliable delivery of electricity. New technologies, such as Advanced Distribution Management Systems (ADMS), are now opening doors for modernization of electrical systems on a national scale. For Ecuador, with a land surface of nearly 110,000 square miles and diverse landscape including the Amazon jungle, Andean highlands, the wildlife-rich Galápagos Islands and a population of over 16.6 million people, power stability had long been an issue. A highly fragmented electrical distribution network managed by 20 different electrical companies presented a challenge for implementing a world-class ADMS while an aging infrastructure caused frequent power outages. As a result, the Ecuadorian Ministry of Electricity and Renewable Energy (Ministerio de Electricidad y Energía Renovable) in cooperation with electric distribution utilities launched the SIGDE (Sistema Integrado para la Gestión de la Distribución Eléctrica) project in order to modernize its national power distribution network. Over the years, the 20 electricity companies had all pursued totally different management models, making it increasingly difficult to manage grid performance and to execute grid maintenance quickly and cost-effectively. Modernization would require updated technologies to centralize the management function and accurately measure and report on grid performance throughout the various geographies. One of the core solutions implemented was a smart grid solution including an Advanced Distribution Management System. ADMS is a software platform that supports network operators and planners in comprehensive management and optimization of electrical distribution equipment. An ADMS includes functions that automate outage restoration and optimize the performance of the distribution grid. By integrating electrical distribution operational applications into a single platform, management of the overall system is streamlined, resulting in improved workflow and simplified task execution. EcoStruxure™ ADMS is composed of a DMS (Distribution Management System), SCADA (Electrical Supervisory Control and Data Acquisition system), OMS (Outage Management System), and EMS – PCS (Power Control System), and introduced intelligence to multiple layers of the network. This enabled new capabilities, including comprehensive monitoring, analysis, control, optimization, and planning. After full implementation, the visibility to the distribution network rose from 5% to 94%, laying a foundation for advanced energy management, greater grid reliability, and efficiency. Rich in renewable energy resources, Ecuador is now able to smoothly integrate renewables. With this solid infrastructure in place, Ecuador can now focus on building a brighter and more sustainable future. To learn more about Ecuador’s success, please read the case study. 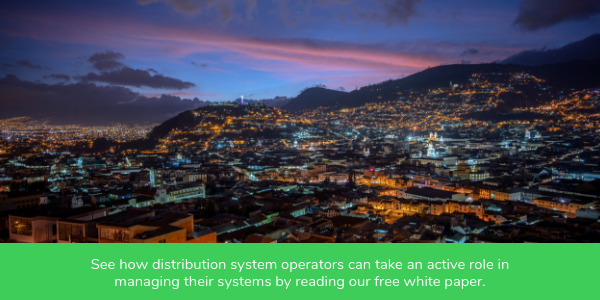 See how distribution system operators can take an active role in managing their systems and adapt to varying conditions in real time by reading our free white paper “Advanced Distribution Management Systems: The Foundation of Distribution System Operations”.